• The annual Christmas Parade is set for Saturday. Santa Claus will head to the downtown gazebo for photos and treats Saturday after the Cave Spring Christmas Parade, which is scheduled to start around 6 p.m.
Save the date Saturday night for the Christmas Parade in historic Cave Spring. "Come early, have lunch, enjoy our antique places and Christmas shop," said City Council member Nancy Fricks, one of the organizers. The lineup will start at 4:30 p.m. at Perry Farm Road, with the cavalcade officially set to start at "dark-thirty." "That's probably 6 or 6:30," Fricks said with a laugh. "It takes about a good hour or more to line up everybody and the horses." The parade heads straight through town to Rolater Park, so every spot along the road is a good one. The theme this year is the same as Rome's parade — A King Is Born — in case anyone wants to bring their float on down, but always expect surprises. "It's unique. That's all I can say. It's come-as-you-are," Fricks said. That's because there's no pre-registration and no cost to enter. People just "show up and join in," she said. The annual event typically draws dozens of creatively decked vehicles, from ATVs and golf carts to classic cars, wagons and flatbed trucks. Santa Claus will be bringing up the rear on the city's fire truck, and will head over to the gazebo after the estimated 25-to 30-minute procession ends. "That's for anyone who wants to take pictures, and we'll be giving out treats for the kids," Fricks said. Grand marshals Sandra and Larry Lindsey also will be awarding trophies for the best floats: first, second and third place. Rain is forecast for the weekend. Fricks said they're still hoping the forecast will change, but they'll announce an alternate date later if it doesn't. Established in 1832 in southern Floyd County at what is now the nexus of U.S. 411 and Ga. 100, Cave Spring boasts a population of about 1,200 and more than 90 structures on the National Register of Historic Places. Its namesake spring, where the city gets its drinking water, flows from the limestone cave in Rolater Park that is open for visitors during the day. • Prep Baseball Report will become a flagship operator. The massive LakePoint Sporting Community in Bartow County is getting a new baseball partner — Prep Baseball Report. Perfect Game baseball has been the venue's baseball partner since LakePoint opened, but Prep Baseball Report will bring youth baseball stars of tomorrow to the complex beginning in January. Rimrock Capital Management revealed plans this week to make a major investment in Prep Baseball Report, which operates youth baseball events in 41 states and Canada. The partnership expects to strengthen PBRs position in the travel baseball industry and further enhance LakePoint's role as the leading host for national competition. Perfect Game is not completely abandoning LakePoint. Don Berman with Glass-Ratner, an adviser to Rimrock, said PG will continue to host a number of major national tournaments at LakePoint this year. "They're going to have their biggest events of the year here at LakePoint next summer," Berman said. Prep Baseball Report was founded by Sean Duncan in 2005. Initially it was a print magazine in Illinois. Over the years, the company shed the magazine and moved to an online scouting presence and built its base on a state-by-state basis. "All the colleges and pro teams subscribe to our services in every state we're in," Duncan said. "Running events and tournaments is something we've always done." Berman said investors bought in to PBR in an attempt to integrate sports operations with its real estate assets at LakePoint. "We're marrying their expertise and reputation with our wonderful baseball assets," Berman said. "It's a wonderful opportunity, the timing is right." Duncan said PBR hopes to expand into the Pacific Northwest soon. "We've gotten more into junior college scouting because that is something that is highly relevant in the college and pro circles," Duncan said. He is planning to organize more junior college events along with high school events at LakePoint going forward. LakePoint has eight fullsized baseball fields completely covered with an artificial surface that was developed by another LakePoint partner, Shaw. Berman said Rimrock has not decided yet if there will be any additional baseball fields on the North campus as it really starts to develop in the coming year. A bridge over CSX rail tracks that provides access to the north campus is expected to be complete this spring and a parkway to carry traffic onto the north campus will be completed later in the year. Berman said the U.S. Bankruptcy Court for the Northern District of Georgia has approved a re-organization plan and the sports destination venue expects to formally exit bankruptcy before the end of this month. The north campus is expected to develop with other amenities to make LakePoint a complete destination package for families with young athletes. David Nix pulls electric wiring inside the Fairview-E.S. Brown school building in Cave Spring as part of ongoing restorations. The initial phase of restoration of the old Fairview-Brown school first grade building is nearing completion in Cave Spring. Joyce Perdue-Smith said the completion of the long-anticipated restoration will be a wonderful Christmas gift to the community. Thomas Nix examines one of the old light fixtures that was original to the Fairview-Brown school building in Cave Spring and will be re-installed as part of the restoration effort. Some replacement wood is obvious on the interior of a side wall of the Fairview-Brown building. 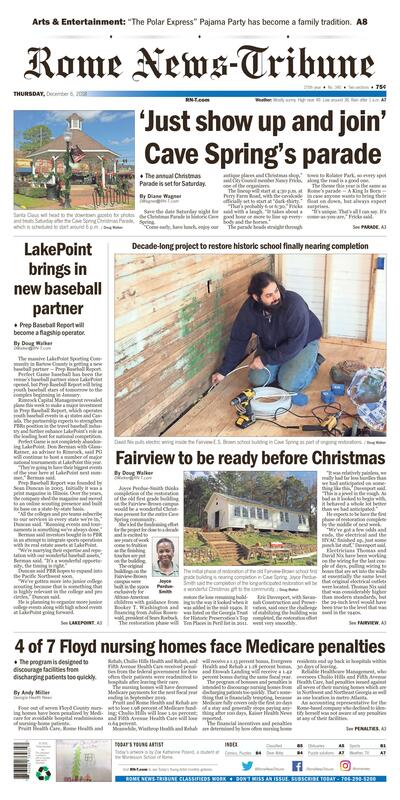 Joyce Perdue-Smith thinks completion of the restoration of the old first grade building on the Fairview-Brown campus would be a wonderful Christmas present for the entire Cave Spring community. She's led the fundraising effort for the project for close to a decade and is excited to see years of work come to fruition as the finishing touches are put on the building. The original buildings on the Fairview-Brown campus were built in the 1920s exclusively for African-American children with guidance from Booker T. Washington and financing from Julius Rosenwald, president of Sears Roebuck. The restoration phase will restore the lone remaining building to the way it looked when it was added in the mid-1940s. It was listed on the Georgia Trust for Historic Preservation's Top Ten Places in Peril list in 2011. Eric Davenport, with Savannah Construction and Preservation, said once the challenge of stabilizing the building was completed, the restoration effort went very smoothly. "It was relatively painless, we really had far less hurdles than we had anticipated on something like this," Davenport said. "This is a jewel in the rough. As bad as it looked to begin with, it behaved a whole lot better than we had anticipated." He expects to be have the first phase of restoration complete by the middle of next week. "We've got a few odds and ends, the electrical and the HVAC finished up, just some punch list stuff," Davenport said. Electricians Thomas and David Nix have been working on the wiring for the last couple of days, pulling wiring to boxes that are set into the walls at essentially the same level that original electrical outlets were located. Thomas Nix said that was considerably higher than modern standards, but the 29-inch level would have been true to the level that was used in the 1940s. Old pull-chain ceiling light fixtures that were original to the school building have been cleaned up and will be re-installed to accommodate old Edisonstyle light bulbs that were original as well. When walking on the floor of the old school building, one can still feel that a joist in the middle of the flooring is somewhat higher, but again, that is in keeping with the effort to save as much of the original building as was humanly possible. Replacement flooring is obvious in some places as is replacement wood in the interior side walls. Davenport said a handicapped ramp planned to go on the back side of the building was delayed until the second phase of the project and as additional funding is secured. It took nearly a decade of fundraising, capped off in the last year by a challenge contribution from Wes Walraven and Brian Moore, owners of the Lyons Bridge Farm in Cave Spring, to get the restoration going. Moore and Walraven agreed to contribute $75,000 if the community raised another $100,000 by the end of this past August. The community stepped up and met the challenge before the end of March. Those funds, coupled with earlier grants and fundraising efforts, brought in enough money for restoration work to begin in September. Davenport said if all goes well, their work should be completed by the middle of next week. • The program is designed to discourage facilities from discharging patients too quickly. Four out of seven Floyd County nursing homes have been penalized by Medicare for avoidable hospital readmissions of nursing-home patients. Pruitt Health Care, Rome Health and Rehab, Chulio Hills Health and Rehab, and Fifth Avenue Health Care received penalties from the federal government for how often their patients were readmitted to hospitals after leaving their care. The nursing homes will have decreased Medicare payments for the next fiscal year ending in September 2019. Pruitt and Rome Health and Rehab are set to lose 1.98 percent of Medicare funding; Chulio Hills will lose 1.91 percent; and Fifth Avenue Health Care will lose 0.64 percent. Meanwhile, Winthrop Health and Rehab will receive a 1.15 percent bonus, Evergreen Health and Rehab a 1.18 percent bonus, and Etowah Landing will receive a 1.42 percent bonus during the same fiscal year. The program of bonuses and penalties is intended to discourage nursing homes from discharging patients too quickly. That's something that is financially tempting, because Medicare fully covers only the first 20 days of a stay and generally stops paying anything after 100 days, Kaiser Health News reported. The financial incentives and penalties are determined by how often nursing home residents end up back in hospitals within 30 days of leaving. Reliable Healthcare Management, who oversees Chulio Hills and Fifth Avenue Health Care, had penalties issued against all seven of their nursing homes which are in Northwest and Northeast Georgia as well as one location in metro Atlanta. An accounting representative for the Rome-based company who declined to identify herself was not aware of any penalties at any of their facilities. Over this fiscal year, which began Oct. 1, the best-performing homes will receive 1.6 percent more for each Medicare patient than they would have otherwise. The worst-performing homes will lose nearly 2 percent of each payment, according to KHN. Until now, Medicare limited these kinds of incentives mostly to hospitals, which have gotten used to facing financial repercussions if too many of their patients are readmitted, suffer infections or other injuries, or die. Kathy Floyd, executive director of the Georgia Council of Aging, said this week that "tying payments to quality of care is a big step forward." "The headline cites the cuts, but I'm encouraged by the bonuses," Floyd said. "Let's find out what those homes are doing to keep readmissions down." Medicare is not measuring readmission rates of patients who are insured through private Medicare Advantage plans, even though in some regions the majority of Medicare beneficiaries rely on those to afford their care, KHN reported. Approximately three out of four, or 75 percent, of nursing homes in Georgia have received penalties from Medicare for avoidable hospital readmissions of nursing home patients. The 75 percent figure is slightly higher than the national average. The federal government gave bonuses for lower readmissions to 23 percent of the 373 nursing homes in the state. Two percent had no change under the new penalty program. Staff writer John Popham contributed to this report. Georgia Health News, a nonprofit 501(c)3 organization, tracks state medical issues on its website georgiahealthnews.com. Today's artwork is by Zoe Katherine Poland, a student at the Montessori School of Rome.